Eric wrote the "Fly of the Month" column in Field & Stream from 1972 to 1979 and was founding editor of the Field & Stream Book Club. He currently is involved in the educational software business. My stonefly nymph was dreamed up in a Salt Lake City motel room the night before my first trip to Yellowstone country about 30 years ago. I suspected we'd need some big, heavy black nymphs because the trip was right around Memorial Day weekend, and I suspected we'd have to fish some high and very cold water. I'd never seen a natural or even a photo of a Pteronarcys nymph, so my concoction was based strictly on verbal descriptions. As it turned out, about the only fishable water we found in the area was in the Firehole and Gibbon and in the Henry's Fork below Ashton Dam. The nymph found fish -- and lots of them -- every day for everyone in our group that tried it, but it was particularly effective in the upper Firehole around Ojo Caliente. There were seven anglers in our party, but only two of us tied flies. Between us, I estimate we tied seven or eight dozen of these nymphs in four days. Thank God, it was a simple fly to tie! 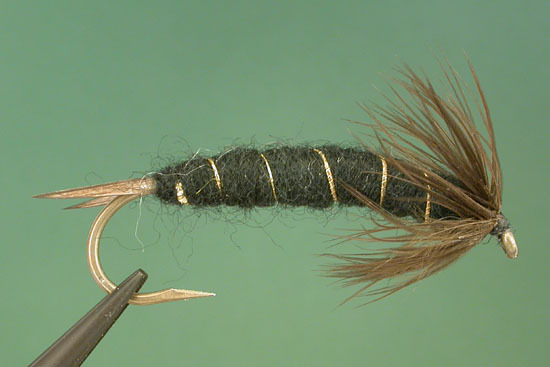 The original pattern had a black hackle fiber tail and had neither the gold tinsel rib nor the bent hook. Over the years, I added the biot tail and the other two features more for cosmetics than because they added to the fly's effectiveness. Since its inaugural trip in 1970, the nymph has worked for me all over the US as both a stonefly imitation and in waters where hellgrammites are found.